An Introduction To Visiting Brussels - A City Of Stylish Architecture, Vibrant Culture & Exceptional Chocolate! Tagged as the capital of Europe, Brussels boasts a number of attractions to lure the most fussy of travellers. From fine dining and quaint architecture to a vibrant nightlife and it's many landmarks, there's something to appeal to everyone in Brussels. Look around the streets of Brussels and you'll see people from a wide variety of backgrounds and culture - a testimony to the cosmopolitan nature of the city. Aside from the many ex-pats posted here from around the world, Brussels also plays host to immigrants from Turkey, Greece and North Africa. The dominant language in Brussels is French, but Flemish is also spoken in certain pockets of the city as is a unique mix of the two languages (called Marollien or Brusselse Sproek). So what's Brussels characterised by? - Fine food and tasty beers. You can't help but be impressed by the wide variety of food options open to the Brussels visitor. The national dish is "moules et frites" and must be sampled but the city also offers a magnificent choice of ethnic foods including Turkish, Chinese, Moroccan, Vietnamese, Tunisian, Italian and more. 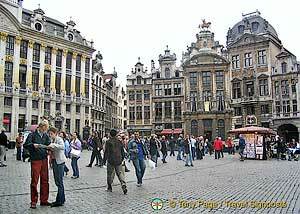 - The vibrant "Grand Place" is the very heart of Brussels and should be the first port of call for the newly arrived visitor. Many believe it to be among the finest town squares to be found anywhere in the world. 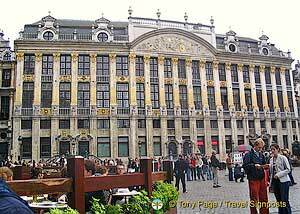 - Brussels gave birth to the "Art Nouveau" architectural movement in the late 1890's. This was to spread to many other countries who embraced the bold new combination of materials such as stone, iron and exquisite tiles. Some examples of famous landmarks you can visit that are a testimony to the movement are the Hotels Metropole & Solvay, Musee Horta and Maison Saint Cyr. The Art Nouveau movement was spearheaded by Belgian architects Victor Horta and Henry van de Velde. - Lovers of architecture, museums and cathedrals will be satisfied by the good mix on display. Aside from the wide range of museums, there's the "Cathedrale des Sts Michel et Gudule" , the origins of which can be traced back to 1072. Whether you come to Brussels for the culture, architecture or just the heavenly chocolate, you're certain to have an enjoyable time.